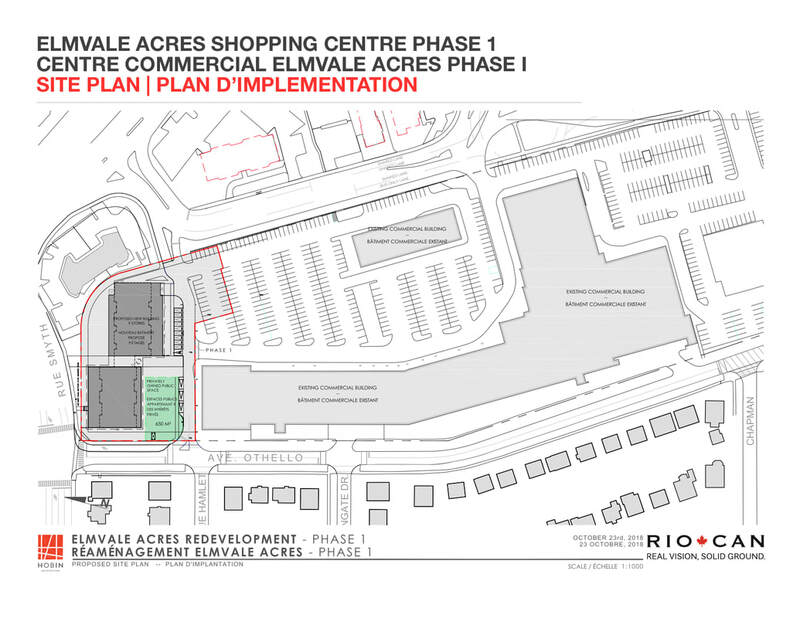 RioCan, the company that owns the Elmvale Mall, will be holding an open house on Thursday, November 15th at Eglise Ste-Genevieve to discuss the details of the site plan process for Phase 1 of the mall redevelopment. Phase 1 is the northern portion of the site, currently occupied by Kelsey's restaurant. That part of the mall will be redevelopped into a 9-story mixed use building with retail on the ground floor and apartments above. This is the first phase in a major redevelopment of the mall -- a plan that was vastly improved by the mobilization of Elmvale Acres residents, who insisted on a secondary plan that respected the existing community. Thursday's meeting is an important opportunity for residents to show we're still very much engaged in this process and want to be heard as the developer moves into the "site plan" stage prior to obtaining a building permit for Phase 1. The feedback provided at this meeting will inform the Site Plan Control Application, which is part of that process. The Elmvale Acres Community Association held a public meeting on Feb. 12th, 2017 to discuss the latest modifications to the proposed RioCan development at 1910 St. Laurent Blvd. [The modifications to the original and updated concept plans are listed below. *Right-Click on the table to enlarge it. *] The meeting was attended by approximately 100 residents and heard many constructive comments and suggestions regarding traffic, site access, construction and retail development. The EACA executive is reviewing feedback received and is planning a path forward while the City of Ottawa Planning Department conducts an analysis of the traffic around the site. Having trouble reading this? Right click on your mouse and select "Open Image in New Tab." Then click the new tab. Click the button on the right to see the Concept Plan drawings RioCan submitted to the City of Ottawa in December 2016. NOTE: These drawings do not include the NEW modifications obtained by the EACA, as described above. There are no updated drawings available at this time. More than 100 Elmvale Acres residents sent messages to the Planning Department, most of them expressing concerns about the proposed RioCan development at the Elmvale Acres Shopping Centre. Click the button on the right to see the results. 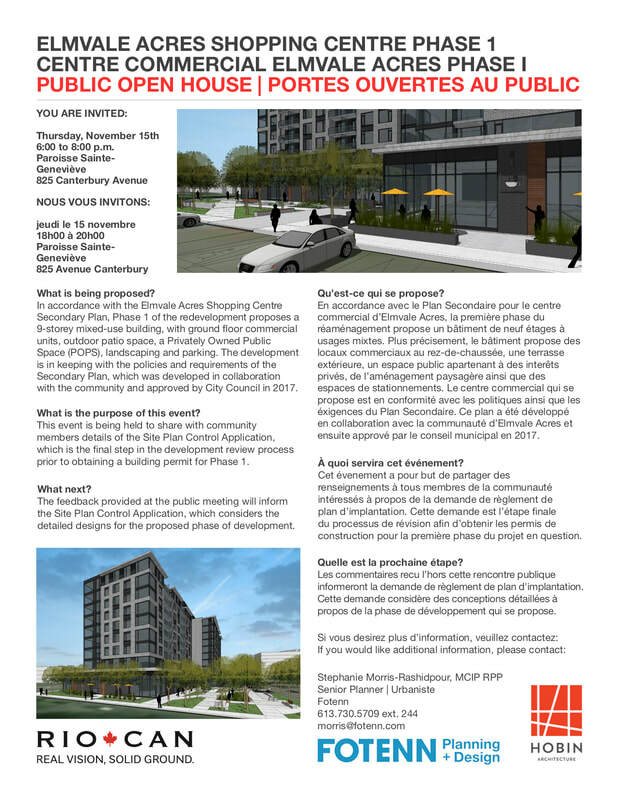 ﻿﻿The City of Ottawa's planning department has sent out a notice regarding the RioCan application and steps in the process. The buttons below will allow you to download an English or French copy of the notice.